Tajon is sixteen and black. He’s tall and skinny, and he wears his hair in dreads. Tajon works hard and tries his best to be good. He does OK in school. He has plans. Tajon is the kind of son who cares about his family. He’s the kind of brother who stands up for his sister. those he loves up and out of the hood. Meet the authors: Mikiah, T’Asia, J’yona, Reiyanna, Jonae, Rose, Najae, Serenity Jeanet, and Temil. Ten black teen girls in Washington, DC started writing this book during the rise of the Black Lives Matter movement. They began with one central question: What really happens in a community when a black youth is the victim of violence by police? Each writer takes on the perspective of a central character – the victim, the police officer, the witness, the parent, the friend – and examines how it feels to be a human being on all sides of this event. Their stories thoughtfully explore issues of race, violence, loyalty, and justice in a community torn apart but seeking connection. 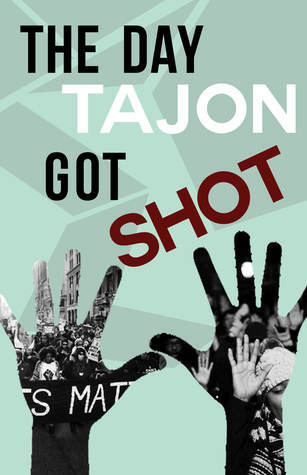 Review: The Day Tajon Got Shot presents Tajon’s story in a unique way. It’s told from many perspectives using many forms of media. It means that we don’t get to know all of the characters in great depth, but we do get to see this one major event from many angles. The writers were careful to show that the characters are not simply good or evil. They show how complex people and situations can be. I enjoyed the mix of photographs, artwork, poetry, prose, and even tweets. The format makes this book appealing to readers who like quick reads. It’s also just interesting to see the different ways the writers chose to communicate. It appears that they staged many of the pictures, but some of the photos seems to have been from actual protests. Some of the images could be troubling for readers who are fatigued after seeing many instances of violence against young Black people. There weren’t any photos of actual wounds, but there were blood stains on the ground and people in frightening situations. The images definitely do the job of communicating emotion. There is also a much too lengthy list of the people of color who were killed by police during the time they were writing the book. For me, that was one of the most difficult parts to read and it really drove home the reason for the existence of this book. This is the kind of book that would be useful for inspiring discussion and could even be a model for other teens who would like to write or do something in response to current issues. The writers want to help make a change. They have hope and tell about the way things are and the way they think things should be. I liked how the different parts of the book worked together. All of the pieces supported the story from text formats to the graphics to the layout. The dedication kicks it off, “This book is for all those who are going through loss and pain, who have protested, and who are sick and tired of what is going on.” The next element is a quote from Justice Sonia Sotomayor referencing, “… people who are routinely targeted by police….Until their voices matter too, our justice system will continue to be anything but.” The quote is followed by a preface which was surprisingly lengthy. It provides the context for the project though and has helpful information. Some readers may just skip to the artwork and opening poem, “The Evidence” by Camisha Jones, which is quite powerful. There are photos and brief descriptions of each main character followed by the narrative which alternates between characters with breaks for media. The writing isn’t incredibly sophisticated, but that made sense within this format of brief sections. Also, I appreciated that the voices of the teens hadn’t seemed to be overpowered by adult editing. The authors took risks sharing the realities they see in their own way. They stepped out in the hope and belief that their voices matter and they created a book that will surely inform and affect many readers. Recommendation: Get it soon if you’re looking for realistic fiction about current events, especially if you’re interested in hearing directly from teens. This sounds like a unique and valuable project, giving voice to the teenagers themselves. Thank you for letting us know about it!